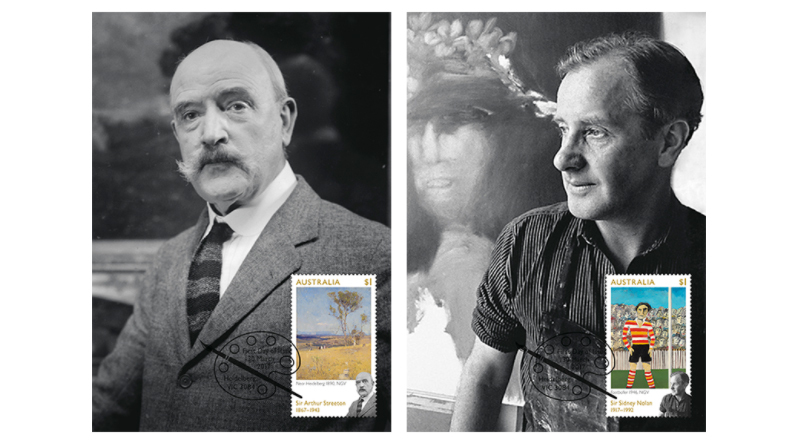 This year marks the birth anniversaries of two great Australian artists, Sir Arthur Streeton (1867–1943) and Sir Sidney Nolan (1917–1992). Alongside fellow Australian Impressionist artists, Streeton endeavoured to depict the unique qualities and intense light of the Australian landscape. 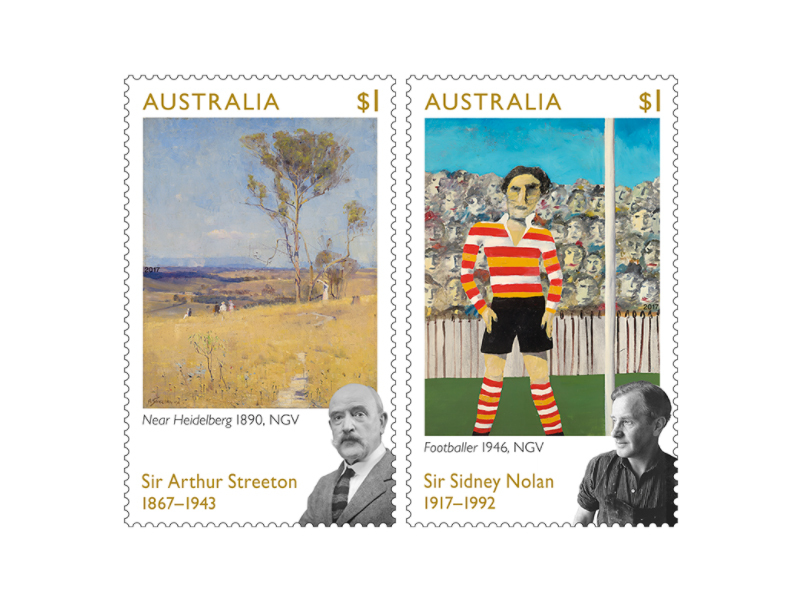 A leading figure of Melbourne’s Heide Circle of modernist artists, Nolan’s colourful, expressionist works included interpretations of the Australian landscape and iconic figures like Ned Kelly and Burke and Wills. 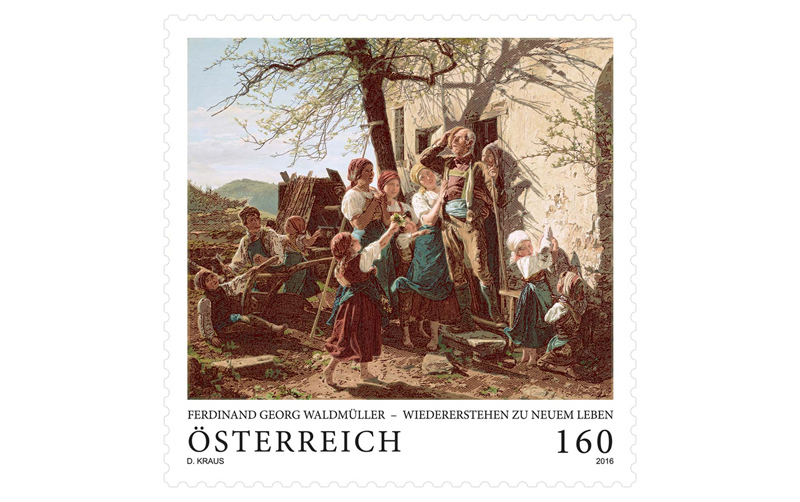 The stamps represent a work by each artist together with a photographic portrait. 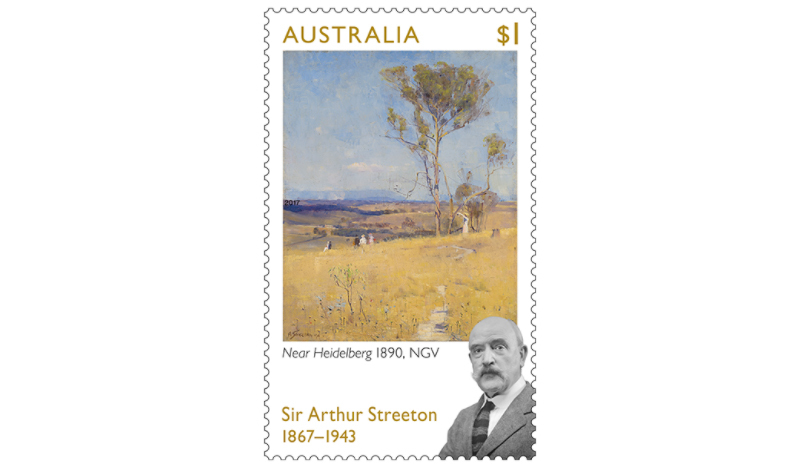 Streeton was a member of the Heidelberg School of painters. Influenced by the French Impressionists, these artists painted outdoors and aimed to create a new type of Australian art. The oil on canvas work, Near Heidelberg, now in the collection of the National Gallery of Victoria, was painted at Eaglemont, then on the outskirts of Melbourne, in 1890. With a blue and golden palette evoking a warm, sunny day, it shows well-dressed men and women walking down to the Yarra River. 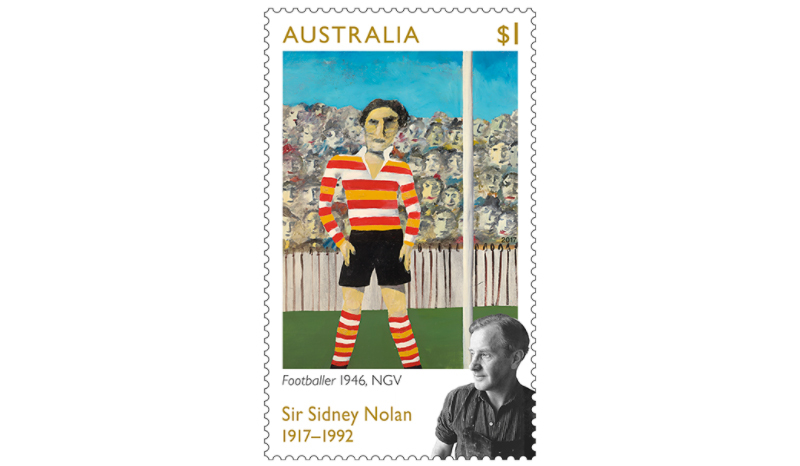 Nolan is represented by his enamel on composition board Footballer, 1946 also in the collection of the National Gallery of Victoria, which shows an Australian rules footballer before a crowd of fans. The jersey colours are intentionally generic, but the figure is thought to represent a St Kilda player, although opinion varies as to his identity. With its bold colours and forms the painting is characteristic of Nolan’s Expressionist realism of the 1940s.